Geoff and Dot's Home Page- "Along The Way" - Christian Friendship and Bible Help with Encouragement. We have just returned from holiday in Devon and have again marvelled at the Beauty of GOD'S Creation and been reminded of some of the Truths we read in His Word , the Bible..
We saw the sea and the greatness of the Oceans and yet they are all kept in their place because GOD has set them a boundary that they may not pass over. (Psalm 105:9). 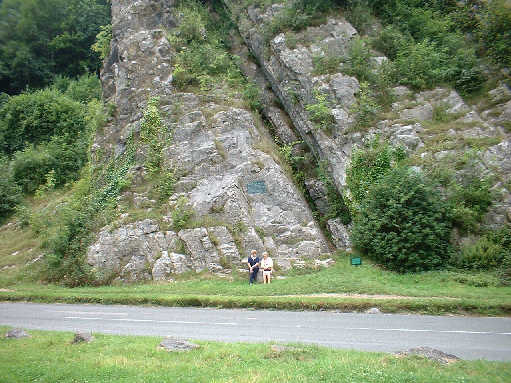 On our way home, we visited Burrington Coombe to see the Cleft in the Rock where the Rev. Toplady was inspired to pen the words of the well known Hymn, "Rock of Ages". Standing by that great Rock, we looked so small and insignificant, yet we are known individually by our Great GOD. Just as that Rock is so solid and unmovable, so is GOD. As Christians we can stand secure in His Love and Protection. Click here to see picture of "Rock of Ages."